There aren’t many brands out there that can boast the rich heritage that Carhartt can. Carhartt holds a legacy that spans over 100 years, from supplying apparel to the workmen who helped shape America to dressing some of the biggest Hip Hop figures of the 90’s. Since its early years of making overalls, that were constructed from denim and duck canvas, Carhartt has been dedicated to providing apparel that is tailored to meet the highest standards of quality, durability and comfort. Carhartt’s story begins all the way back in 1882, when Hamilton Carhartt left school to start a wholesale furniture business. In 1898 the business was converted into a devoted manufacturer of mens workwear apparel. Despite failing initially, Carhartt refused to give up and decided to ask railroad workers what they were looking from the garments. Using this as a template for his designs, Carhartt went on to produce honest workwear pieces that ticked all the boxes and from then on the company never looked back. 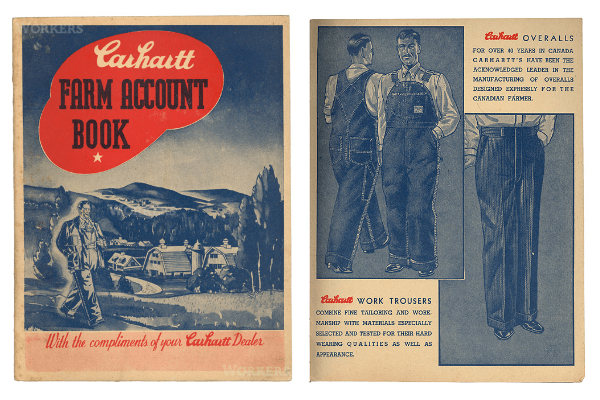 By 1925, Carhartt had plants across the globe stretching from Liverpool, Vancouver, Paris and New York to name but a few. The same year saw the brand set up their first subsidiary, Hamilton Carhartt Junior – Manufacturer, which would specialize in young mans working apparel including overalls, shirts, pants and shoes. This was a clear indication of Carhartt’s desire to expand their product range and also an early indication of the brands vision. The following decade would prove to be tough times for the company. Due to the Cotton Depression of the 1920’s and the Great Depression of the 1930’s, many of the brands key locations were lost along with sales territories in the south of America. 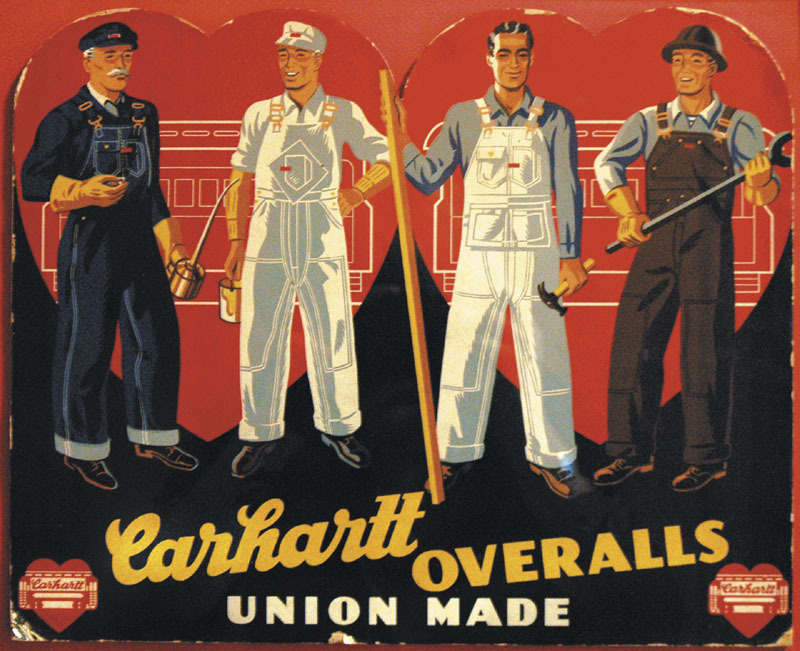 Despite the adversity the company was facing, Carhartt continued to solidify its reputation for quality clothing and this reputation is what saw them through. Its signature construction techniques, from its strong and durable tightly woven cotton duck to its triple chain stitching over its felled main seams that gave the garments strength , meant Carhartt were the go to brand for all workwear needs. Its robust clothing could withstand all the rigours of working life and, perhaps inadvertently, looked good as well. Fast forward to the 70’s and Carhartt established their first contemporary Subsidiary – Carhartt South Inc which specialised in producing Jeans. These subsidiaries continued to pop up throughout the seventies until the brand decided to streamline the organisation structure by merging all subsidiaries with its parent company in the late 80’s. This same decade also saw the brand launch its first national marketing programme. Expansion continued through to and throughout the 90’s with acquisitions of several new sewing plants in new locations bringing the brand to more people worldwide. Workwear was making its way into the world of fashion in the late 80’s and early 90s and Carhartt were fully aware of that. They had been selling their clothing to the Japanese lifestyle market since 1987, and decided to display its outdoor working jacket at New York fashion shows for the first time in 1991. This really kicked things off with the ‘Workwear’ trend and by 1993, thanks to the clockers and sprayers, Carhartt was hitting the streets, catching the attention of rappers and hip hop stars who began adopting the brand. Soon after, Carhartt was popping up on TV shows and printed publications such as Vogue and Harpers Bazaar. Carhartt had well and truly arrived on the fashion scene. In 1994, Carhartt founded Carhartt WIP. Work In Progress or WIP for short would be the distribution network for Carhartt across the pond, introducing a selection of their most iconic classic shapes from their original work wear range into the new European market. Having answered the call of fashion conscious Europeans, success was immediate. The classic shapes became a favourite with the consumers in no time thanks to the large interest in US heritage garments and the desire to recreate their favourite rappers look. Carhartt WIP was widely received across the continent. In 1997, Carhartt WIP under the provision and consent of the brands Michigan based HQ, released its own product range which had been adapted and re-worked to fit the demands of the active life and urban environment, while remaining true to Carhartts core values of quality, durability and comfort. Since the first range, the brand has continued to develop products with the European market in mind, and has since become one of the leading street wear brands not only in Europe but worldwide. Their ability to honour their heritage and still update their designs for the modern consumers means that Carhartt have found a happy medium between workwear and street wear through their various ventures. They play a huge part within different communities, showing support to artists, musicians and riders alike. A big part of what they do is linked with the BMX and Skateboarding scene, from sponsoring an event or helping to develop skate parks, the brand has gained huge respect from the lifestyle’s they promote, alongside their quality, no fuss clothing. The latest instalment of Carhartt goods has arrived with us for Spring 2015 and it is much what we have come to expect from the brand. With a large focus on construction and material, the new collection continues to feature a nice mixture of wardrobe staples including plaid shirting, sweaters, tees, bottoms and some light outerwear.